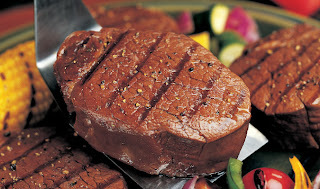 Only $45 for $165 Omaha Steaks Package + Free Shipping! For a very limited time at Plum District, you can get a $165 Omaha Steaks package for as low as $45.00! The package is on sale for $75.00, but use the code cyber40 to take 40% off to make it $50. To save even more money, new Plum District members get an instant $5 credit (must use links in this post), making the package only $45.00! This deal includes four (8 oz.) Private Reserve Top Sirloins, four (4 oz.) Boneless Pork Chops, four (4 oz. approx.) Boneless Chicken Breasts, 4 (4 oz.) Omaha Steaks Burgers and 4 Creme Brulee for dessert. Plus, it’s shipped free! You'll receive all the food in 3-10 days!